Whether with USB port for charging smartphones or in especially slim and unobtrusive design, whether with motion sensor or day/night sensor: the plug-in night lights in the LUNETTA Advanced family cannot fail to impress thanks to a host of added functions. All models offer uniform light distribution and warm white light with an intensity of between 3 and 10 lumens. Sleep more comfortably in a soothing and cosy atmosphere with the LUNETTA HALL plug-in night-light. This light sheds a warm-white light that makes it easier for both children and parents to sleep well. The square shape of the LUNETTA HALL night-light perfectly fits the shape of the socket. And thanks to the day/night sensor, operating the night-light is a piece of cake: the light automatically switches on when dusk falls. The night-light is also energy-saving thanks to modern LED technology. The LUNETTA Shine plug-in night-light and its warm-white light are enchanting additions to any bedroom. The discreet lighting ensures more safety and security at night in children’s rooms, making it easier for parents to get a good night’s sleep as well. LUNETTA Shine also scores big thanks to its energy-saving LED technology and a day/night sensor that automatically activates the light when the sun sets. A matte polycarbonate diffuser creates a comfortable, non-glare lighting atmosphere, and with a lifespan of up to 100,000 cycles, you’ll enjoy your night-light for a long time to come! Multi-coloured dreams and relaxed sleep are on the horizon with the LUNETTA Shine RGB plug-in night-light. The integrated RGB colour changer makes this luminaire an ideal night-light in your children’s bedrooms. A day/night sensor activates the light at night, giving you colorful hours all through the evening. The light shed by the LUNETTA Shine RGB night-light is even and discreet, creating a harmonious, calming atmosphere. With the LUNETTA Glow night-light in your room, relaxed, restful sleep and maximum safety are no problem at all! 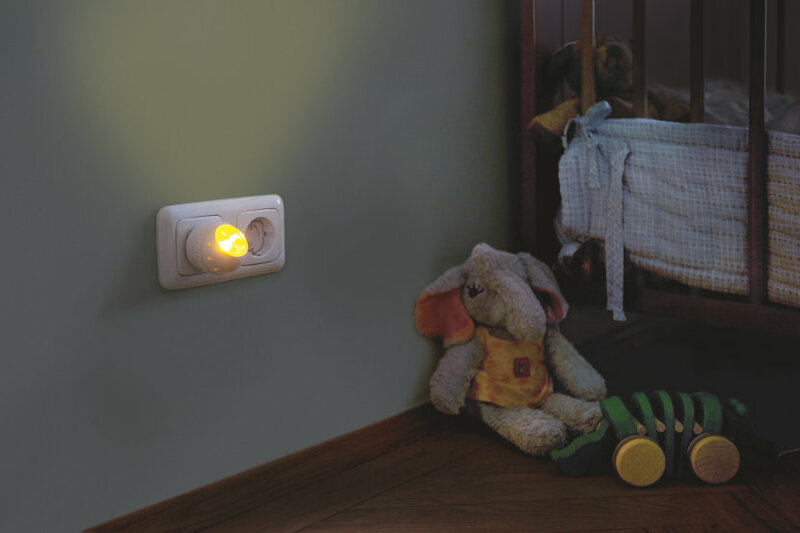 The beautifully designed night-light enchants with a warm-white glow on the wall of your children’s bedrooms, making it easier for them to orient themselves in at night and keeping a fear of the dark at bay. The day/night sensor allows the LUNETTA Glow night-light to switch on automatically when it gets dark outside. Thanks to LED technology the night-light is extremely energy-saving and has an impressively long lifespan of up 25,000 hours. LUNETTA LED is a versatile LED orientation luminaire fitted with Euro plug. The integrated sensor controls the luminaire according to the brightness and the robust luminaire head, which can be pivoted by 360°, allows optimum light control. The prismatic light cover ensures uniform light distribution. LUNETTA LED COLORMIX is a versatile LED orientation luminaire fitted with Euro plug. The integrated sensor controls the luminaire according to the brightness and the robust luminaire head, which can be pivoted by 360°, allows optimum light control. The prismatic light cover ensures uniform light distribution. Do you want to know more about modern lighting?